Durban, South Africa (CNN) - Everything was shaping up so nicely. Two heavyweights of the world game, led by coaches capable of masterminding flamboyant play, a stadium crafted by the Gods and a location on the warm, sunny shores of Durban, South Africa. Even Paul the Octopus had predicted a winner (correctly as it turns out). 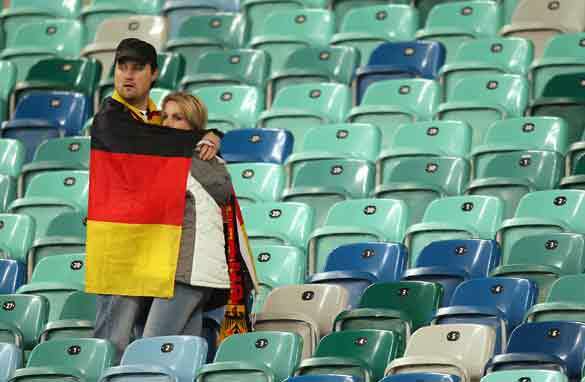 So why did the World Cup semifinal between three-time winners Germany and current European champions Spain produce such a damp-squib of an atmosphere at the Moses Mabhida Stadium? It certainly wasn’t the football. Though the 1-0 scoreline may not have suggested a rollercoaster of drama, for the soccer fan purist there was action-a-plenty, as an intriguing tactical subplot produced nail-biting moments in both halves. Spain were imperious in patches, dominating possession as if the ball were a toy to be shown but not shared with jealous playmates. Coach Vicente Del Bosque controversially dropped star striker Fernando Torres to the bench for the start, leaving the side from the Iberian peninsula to craft attacks through guile and creativity rather than rely on the pace and ingenuity of the misfiring man of Liverpool. The game became a up-scale chess match — requiring a steely nerve and cool application of talent from both players and coaches. Xavi and Andres Iniesta pulled strings through the midfield with magnificent intelligence — as they have so often with club side Barcelona — and as the game went on, their play wore down the supreme Bastian Schweinsteiger in the center of the park. Spain also managed success where the likes of Fabio Capello and Diego Maradona had failed, namely to compress the play in such a manner that Germany could no longer rely on their swift counter-attacking to penetrate the opposition defense, a fact already made harder through the speedy Thomas Muller’s suspension. The game hung on a knife-edge for much of the 90 minutes, but you would not have known this from the atmosphere in the stadium. For two teams on the brink of the World Cup final, the platform for the biggest showdown in world soccer, the tone was set by a singing of the national anthems to fire up the players that was close to mute. Co-ordinated chanting was almost non-existent once the game kicked off and even the ever-reliable, if slightly irritating vuvuzelas only really lifted the noise levels a couple of decibels during the game. At halftime the queues for drinks and food were insignificant. Even a tout complained he had to sell his tickets for below face value. Where were numbers, where was the passion, the emotion and the expression of pride from those in attendance? Theories abound as to why this was the case. The large space in the roof may have let the atmosphere dissipate too easily, the location may have proved too costly for the traveling of fans en masse or there were a high proportion of neutral fans from the locale making up the numbers. Either way, it was a shame the experience of being present at what was billed to be one of the greatest games of the tournament struggled to raise the pulse in terms of spectator experience, let alone hairs on the back of the neck. Well done Germany for a fantastic showing in South Africa, and congratulations to Spain for building on their superb record at international level, but please, will someone bottle some passion for use at the final in Soccer City? Paul the octopus had already predicted it. The Germans where not so sure yet.I guess Spain would be able to get some redemption from the crisis by winning the world cup. What I saw by tv was a hughe crown waching a artistic demonstration of football. That's what happened. Like in Opera. As a local living close to Cape Town we went to Cape Town Tuesday to do the "Fanwalk" from the station to the Stadium. It was the Netherland Uruguay game. I was absolutely speechless. Drumming, opera type singing on enormous sound equipment, DJ's, other groups all placed at short distances – singing, Vuvuzelas, Police on bikes and horses, helicopters in the air, people on stilts, costumes, noise, and apparently 150 000 people (felt like 250 000). A solid throng of people not dissapating for what felt like hours. A jampacked Waterfront. No impatient or drunk people – smiles and exitement where you looked – all races and nationalities. There is a new vibe in SA, and we all are absolutely appreciative for you coming here – please come again!! No one invited you to the party? Ben, I wonder if you actually attended this game. I was there. What an atmosphere!! Maybe because as it is an expensive trip from Spain there were not many spaniards in the stadium. In all Spain I can assure that the atmosphere was full of happiness and illusion. It could be also that people preferred classical teams to be there: Brazil, Argentina, Italy, England, but not a newcomer in finals like Spain. I think we played a good match. Understand that the South African fan does not have the culture of your typical European or South American fan. Thus this new converted fan lacks an appreciation for the quality demonstrated at Wednesday's semi-final. For these new fans it's all about goals – they have little recognition for possession, precision football which the Spanish demonstrated. For some it was the best technical display by any team at WC2010! As someone who also went to the games in Cape Town, i find your article hard to believe. Just as Herk said, the atmosphere is vibey, fun, happy and definately contagious. I know that journalists and writers enjoy sensationalising, and always see a half empty glass. I would like to read more of your material on the world cup to see whether it balances on the negative. Fans in South Africa are having a blast and enjoying the atmosphere, if you are not... doesnt that perhaps tell you something? I hope you enjoy the finals in Soccer City, you are lucky to have that opportunity, so enjoy it. I got some strange news from my Chinese friend. It sounds crazy but I'll try to translate to English as close as possible. This message was posted on 13-June, 12:04, on Baidu(www.baidu.com) "2012吧", by a myeterious ID, called "Xfromfuture". It says, "I came from the near future, I know many people would feel that I am joking. I would like to prove somthing. My proof is very simple, the current World Cup is receiving very high attention. Holand & Spain would go to the final match. Holand will beat Spain by 2:1 .SNEIJDER & another player, u don't even think of his name came in as replacement would score goals. At first, not many people took it seriously or even made it a joke til Quarter-final. And on 7-July, when Holand went to Final, the message was highly praised. Til that day only, it already has been viewed by 23 hundred thousand viewers, followed by 27063 people. It ranked number one on 2012吧. Yet on the day Spain beat Germany 1-0, the message received more tens of thousand of viewers & followers. Some say it's God prediction. I don't believe that the atmosphere in Durban was underwhelming. The game had a lot of slow patches. I do think that the South Africans have been wonderful hosts, however. This WC is a success. You don't know what ur talking about!!! I was there, and the atmosphere was electric!!!! As SA in USA says, maybe it is because alot of us could not make it to the game due to being stuck on an airoplane unable to land? Airport was chaos. Alot of friends in Durban had to go without their friends flying in from Johannesburg and Cape town – that is something to cry about!